I’m now the official #1 of the PupDogz. Ha, I’m so tempted to put them as a reference in my comic. Be warned. I don’t know what to feel about this. 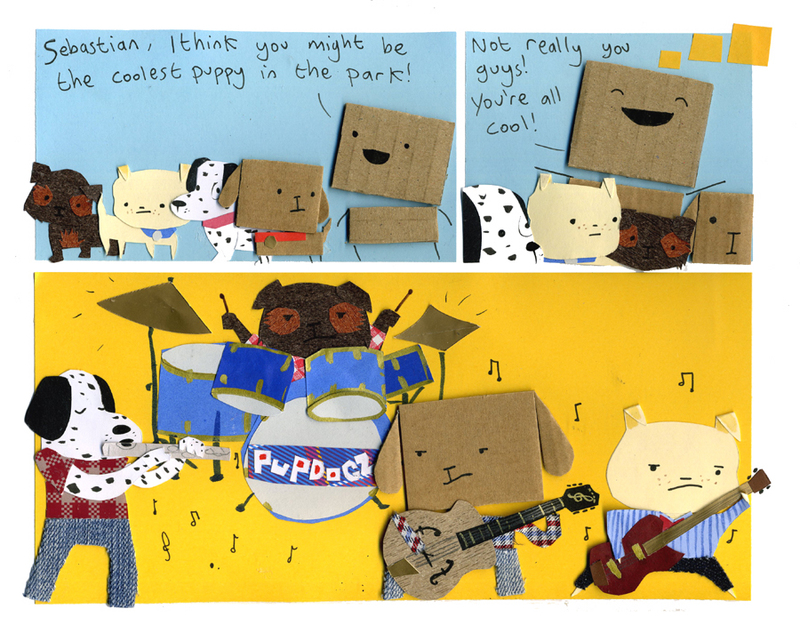 colin’s imaginary dog-band has some interesting instrument dynamics. acoustic guitar, electric bass, drums, and… flute? i wonder what genre they are. Probably a bit of a muttle. clearly they’re a celtic rock band. Colin’s grown-up puppy fantasies get weirder and weirder. I love that last panel!!! This is all so awesome. Always meant to do comics like this and never got around to it. Beautiful colors, shapes, textures, stories, what else is there? Yay! This one was on my birthday! Love your stuff, Colin and Polar Bear are great! Aw cute! Colin is always imagining his dog grown up.